Heather J. Buchanan conducts the 160-voice Chorale, 60-voice University Singers, and 24-voice Vocal Accord. Choirs under her direction have been critically acclaimed for their performances in collaboration with a variety of renowned artists including Meredith Monk, Mícheál ÓSúílleabháin, Tarik O’Regan, and Joseph Flummerfelt; and performed major choral works with conductors Neeme Järvi, Jacques LaCombe, and John Maucceri and the New Jersey Symphony Orchestra. The University Singers performed Meredith Monk’s Songs of Ascension at the Guggenheim Museum, and their 2011 recording of the work received a preliminary Grammy nomination for Best Choral Performance. In 2011, Dr. Buchanan conducted the MSU Chorale and Symphony Orchestra in the East Coast Premiere of the new American oratorio Parables (Aldridge) at Montclair State University. A licensed Andover Educator, Dr. Buchanan specializes in the teaching of Body Mapping and somatic pedagogy for musicians. 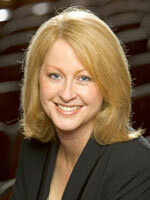 She is co-editor of the GIA choral series Teaching Music through Performance in Choir (Vol.3. released March 2011), has published a DVD-Video Evoking Sound: Body Mapping & Gesture Fundamentals, and choral octavos in the Evoking Sound Choral Series (GIA). She holds degrees from the Queensland Conservatorium of Music, Griffith University (Australia), Westminster Choir College of Rider University, and a PhD from the University of New England (Australia).